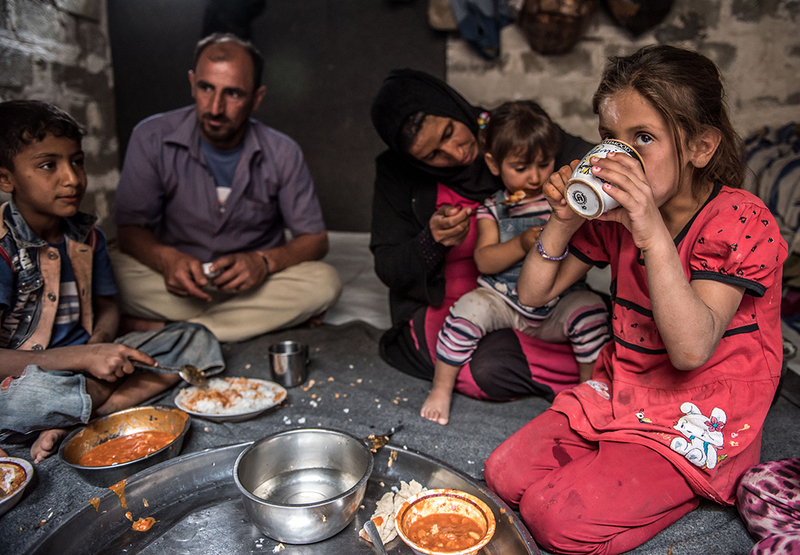 Fighting in central and northern Iraq has forced 4.2 million people to flee from their homes. More than 11 million people are in need of humanitarian aid due to the ongoing crisis. 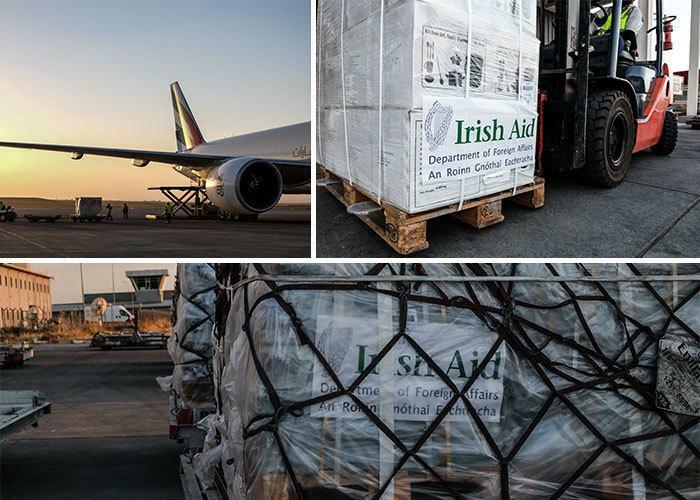 Oxfam is providing life-saving assistance to those who have been affected by the conflict. By Jerry Wessen, Oxfam Ireland’s Communications and Campaigns Intern. The Iraqi city of Mosul was left devastated after occupation by ISIS – homes were ruined, schools were blown apart and infrastructure was uprooted. Now that the fighting has ended, families have returned to the city to rebuild and are slowly sending their children back to school. One school located in west Mosul, Al Rusul Primary School for Girls, was completely destroyed. Muna Husein Kadu, the headteacher of the school explains: “It [the school] was destroyed, the furniture was broken. All our records were all over the floor. There was nothing left for us.” Students are two years behind on schooling and lost records make the situation worse. Other than the school’s building being damaged, the bathrooms were also in dire need of attention. The toilets and sinks don’t work, and new septic tanks are needed - plus the smell makes it unbearable to step foot in the bathroom, let alone use it. With so many obstacles already making it hard for these children to go to school, sanitation should not be one of them. So, Oxfam has focused our efforts on rehabilitating the water and sanitation systems of several schools in Mosul. The efforts to reconstruct the bathrooms in the Al Rusul school took a total of three days, including installing new pipes and water tanks and sanitising the bathrooms. Rehabilitating the bathroom was not the only goal. Gashaw explains: “We fix all the toilets and then we teach them how to use it.” Proper sanitation techniques are as important as new bathroom facilities for keeping communities safe from deadly disease. The soft soil falls away easily as the sharp metal hits the ground. Again and again Falah Abiya raises the axe above his head and brings it down on the compacted earth. Two of his colleagues stand waiting beside him, stepping in with shovels to remove the soil he has loosened. 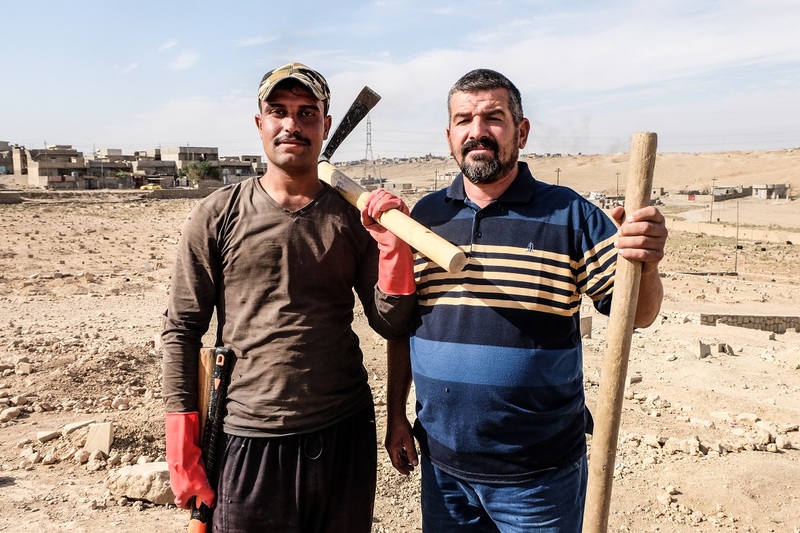 The blue skies, dotted with clouds and the mid morning autumn sun do not match the tough work that Falah and his team have to do in Mosul today. They are digging graves in a large cemetery in the west of the city. “We have twenty-two to dig today”, Falah comments in between swinging his pick Axe. Falah’s team work for the department of Forensic Pathology, which is being supported by Mosul General Hospital. Although they usually spend their days digging graves for people who have just died, today their work is of a different kind. They are working on a special programme to help the state identify bodies that have already been buried. Today Hamid Hassan Jassim stands watching Falah’s team at work; the grave belongs to his brother Mahmud. “He died in a suicide bombing at a checkpoint. His head was missing when we buried him,” he says. Suddenly Falah’s axe hits something hard and he uses his hands to expose a wooden plank which he then pulls from the hole. Three of the team carefully lower themselves into the hole and slowly pull out a black plastic body bag. Everyone is quiet as the team unzip the plastic bag and reveal what is left of Mahmud’s body, wrapped in a red blanket. The forensic examiner pulls on rubber gloves and carefully opens the blanket before inspecting its contents. He immediately confirms the head is missing and through his examination he also suggests that the man did in fact die in an explosion. He takes samples and zips the bag back up. Mosul General Hospital sees an estimated 800 patients a day. As well as providing the pick axes, Oxfam has supported the hospital with essential items such as water tanks, bottled water, emergency food rations, blankets and mosquito nets. Hamid stands and watches Falah and his colleague Sadam Hamadi carefully lower his brother Mahmud’s newly wrapped body back into the ground, re-covering it with the soft soil. They then throw their shovels and pick axes over their shoulders and make a move to the next grave. They have twenty one more to dig today. Nearly 60 million people around the world are now officially “displaced” from their homes – the highest figure recorded by the United Nations since the Second World War. 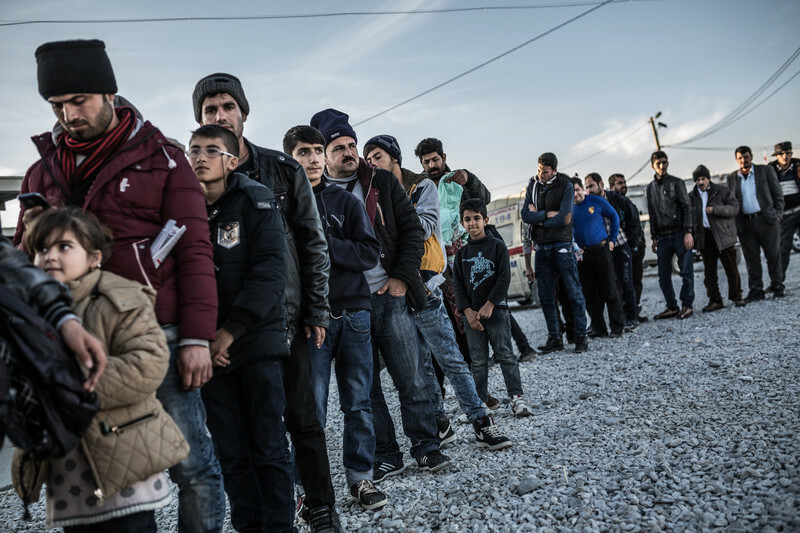 Millions of these refugees are fleeing poverty and conflicts in Syria, Afghanistan and Iraq. Some of them are making the difficult journey to Europe in the hope of a better life for them and their children. In January 2016, the total number of arrivals of refugees to Europe reached 1,167,475 but at least 3,810 women, men and children are dead or missing, lost during the journey at sea or over land. These are not just numbers, they are real people. “People are arriving here exhausted, hungry and thirsty and often in need of urgent medical attention.” Riccardo Sansone Oxfam’s Humanitarian Coordinator in Serbia. 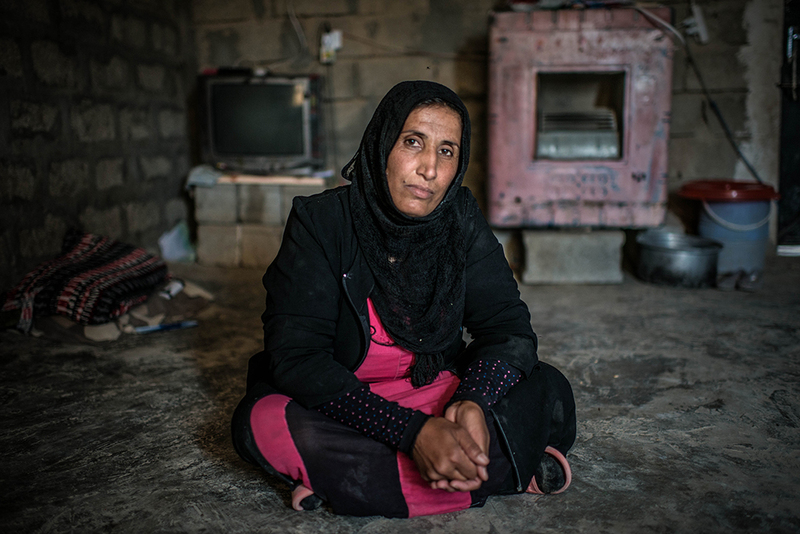 Fatheh, 45, (pictured above) is travelling alone with her 4 children. 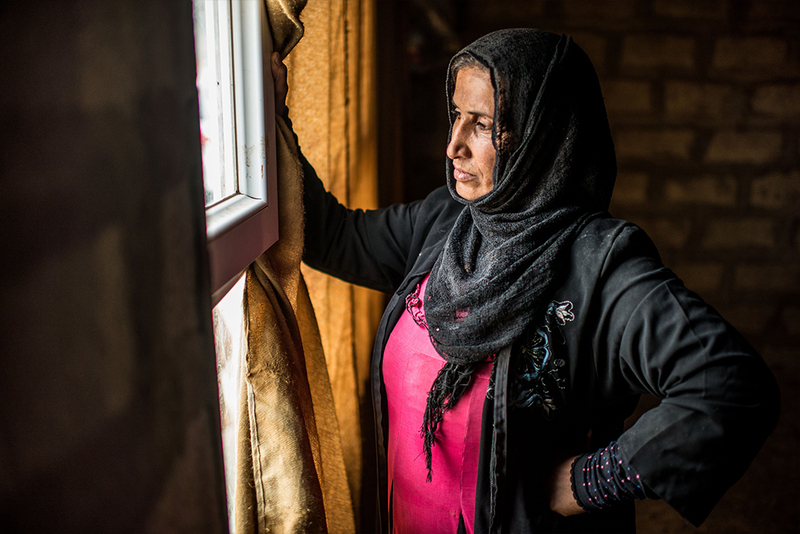 She had to flee Syria, but her husband stayed to take care of his mother who is too old for such a long and difficult journey. “Mine and my relatives’ homes were totally destroyed. There are no buildings left in my neighbourhood. We started going from one place to another. We were refugees inside our own country until we had nowhere to go. At that point, we had no other option but to leave Syria and become refugees. Even if the war ended, I don‘t think we’d ever come back home”. 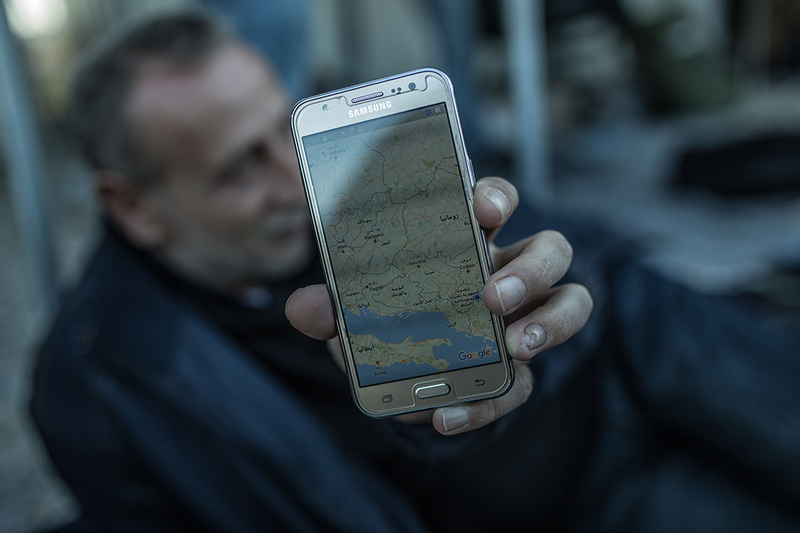 Smart phones are a life-line to migrants and refugees. They help them to plan their journeys and stay in touch with their families. At Oxfam we recognise the importance of information sharing. We are working on the ground to provide refugees with information on safe roads, places, and their human and asylum rights. 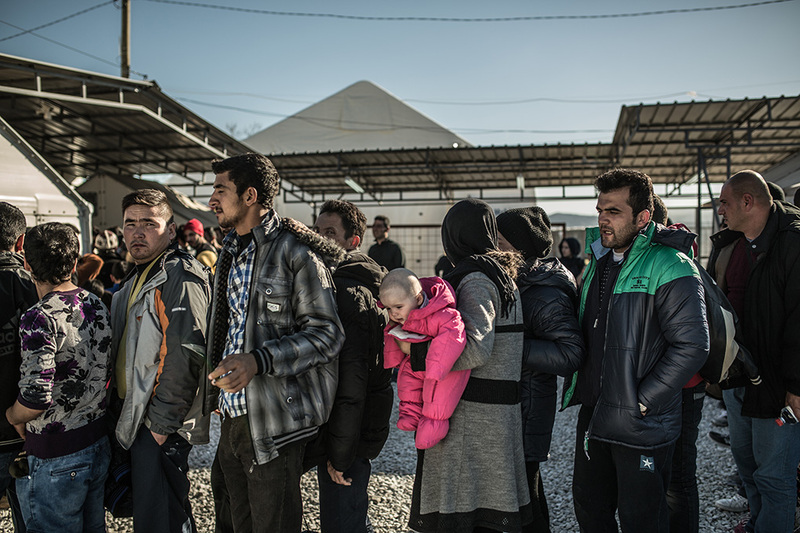 Between October 2015 and January 2016, 985,600 arrivals were documented in Serbia and Macedonia. Many of the refugees along this route come from Syria, Afghanistan and Iraq. To cross Serbia refugees must be granted a travel pass which gives them 72 hours to cross the border out of the country. 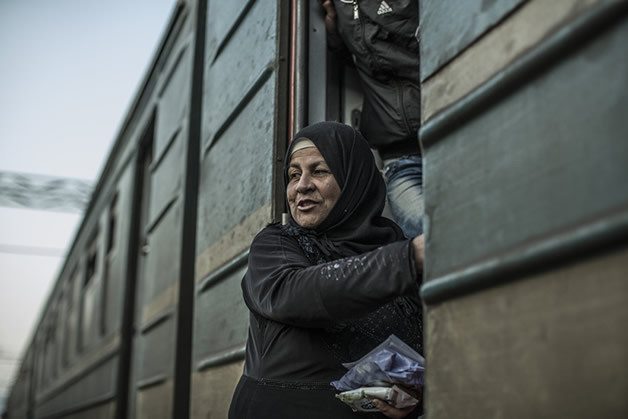 Most refugees, who are mostly women, children and elderly people, make this journey on buses, trains and on foot. For most of the route there are no, or inadequate water, sanitation and hygiene facilities. We believe that everyone has a right to safe water, sanitation and hygiene as a basic essential service. 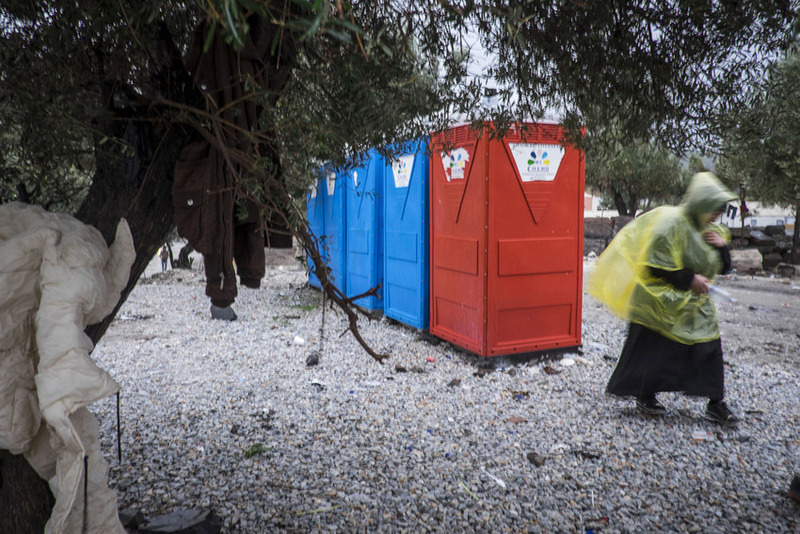 So far we have supplied vulnerable people with portable latrines, sanitary and waste containers and sanitation equipment such as soap and toilet paper in three areas of Serbia. 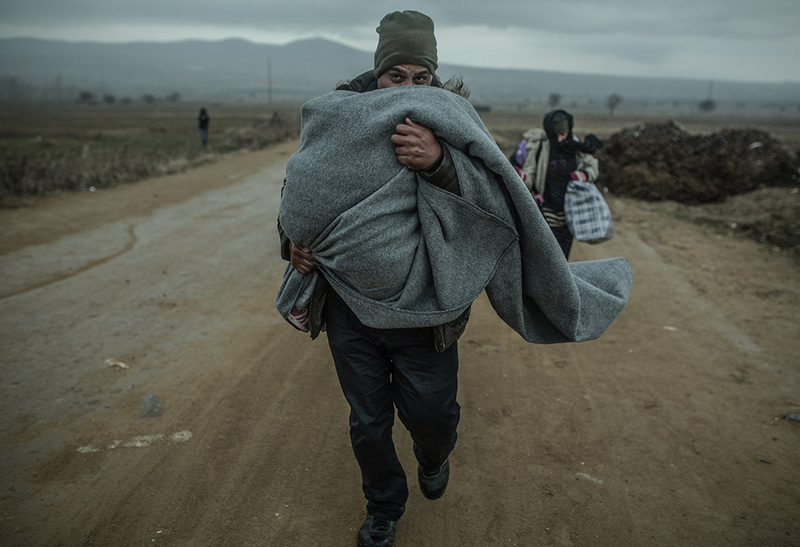 Khalid (pictured above) has wrapped his children in a blanket to protect them from the cold as he carries them towards the Serbian border. He and his family, like millions of others, have fled the ongoing war in Syria. People are only able to take the possessions that they can carry and are not prepared for the winter conditions that they face along the Balkans route, where temperatures drop below -16°C (3°F). Oxfam has supplied around 100,000 refugees and migrants with urgently needed winter items (such as jackets, underwear, gloves, cups, blankets and scarves) during the cold winter months in Dimitrovgrad, Sid, Preševo (Serbia). 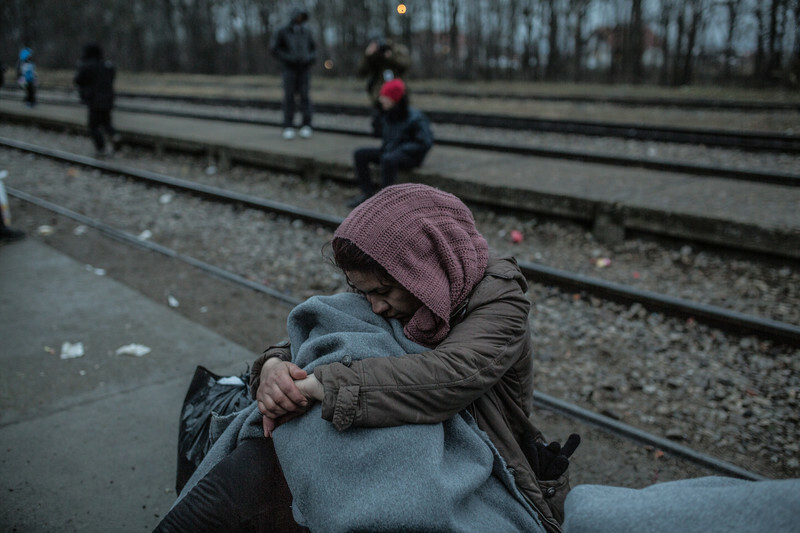 The opening and closing of borders only adds to the challenges that refugees face. 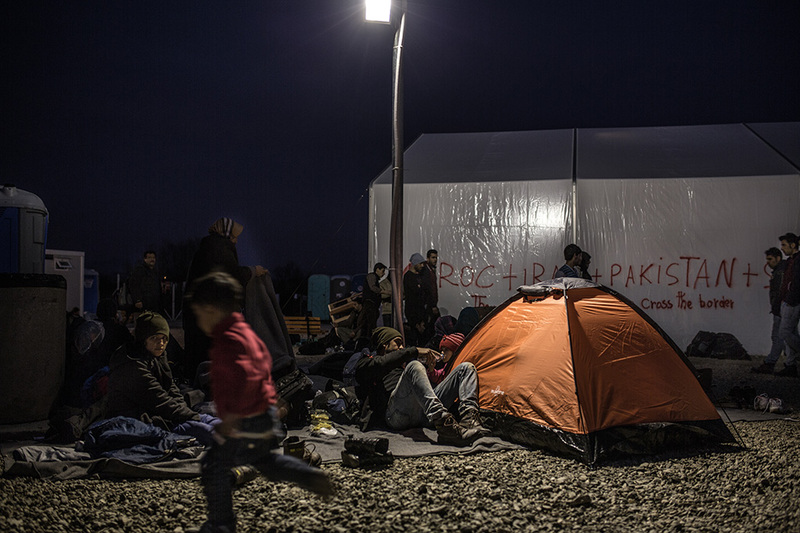 As routes change so do the needs in each location, even the train stations become temporary camps. The Serbian government and NGOs on the ground are warning that the situation will only get worse throughout winter as the heavy snow will make the journey harder and more dangerous. 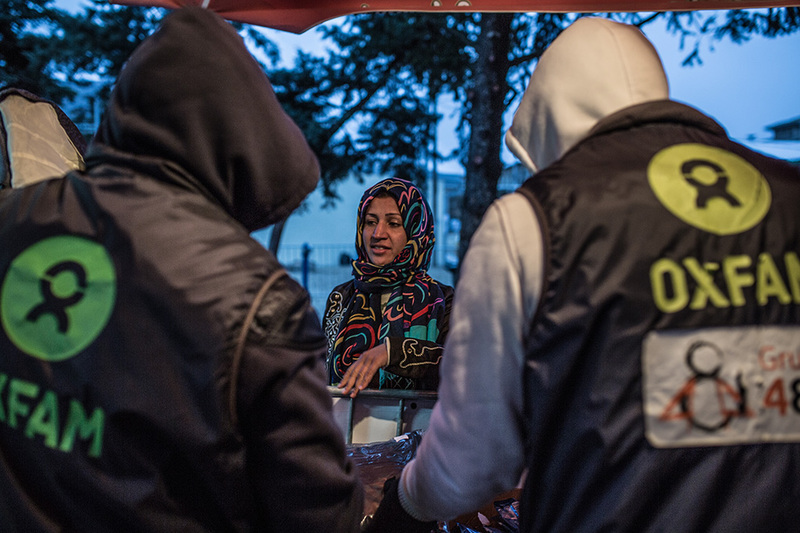 Many of the migrants and refugees arriving in Europe along the Balkan route face daily uncertainty and practical challenges such as the route to take on their journey, from basic information about aid points and available services to the increasing risk posed by human trafficking and migrant smuggling. Most of them are women, children and elderly people. Through close interaction and monitoring of local authorities we support them, by ensuring that local organisations can provide adequate assistance and protection to new arrivals. Besides our protection programme, we are also installing toilets, showers and water points and will be distributing hygiene and sanitary packs, as well as socks, coats and blankets to about 100,000 people in Serbia and in Macedonia. With the Balkan winter here, refugees not only face dropping temperatures, but food and water shortages, poor sanitation, and few winter clothes. The opening and closing of borders only adds to their struggle as routes change and so do the needs in each location. The Serbian government and NGOs on the ground are warning that the situation will only get worse in the coming months: the heavy snow will make the journey harder and more dangerous and people may be unable to continue. We have been working in partnership with UN women to support the distribution of urgently needed items in Serbia and Macedonia following a UN Women gender assessment that shows women and girls' specific needs and vulnerabilities are not being adequately addressed. In partnership, we are also poised to deliver a targeted information campaign to women, capacity-building training to local counterparts and advocacy activities raising the voice of women migrants and refugees. We are helping those arriving in Italy by providing food, clothes, shoes, and personal hygiene kits as well as longer term psychological and legal support. We are supporting asylum seekers to find accommodation, and with cash so that they can meet their basic needs in Sicily and around Florence. We are providing hot meals to people on the Greek island of Lesbos.Thanks to the help of volunteers we are distributing meals of rice, lentils and vegetables once a day in co-operation with Save the Children. We are also preparing winter kits and clothes for distribution on Lesbos and Kos and improving water and sanitation facilities in Moria Camp, Lesbos. Border access is restricted between Greece and Macedonia: only Syrians, Iraqis and Afghans are allowed to cross, while thousands of asylum seekers from other nationalities are stuck in Greece. More than 4 million people have had to flee Syria to escape its civil war. In 2014 we reached nearly half a million refugees in Jordan and Lebanon with clean drinking water or cash and relief supplies, such as blankets and stoves and vouchers for hygiene supplies. We are helping families get the information they need about their legal and human rights and connecting them to medical, legal and support services. 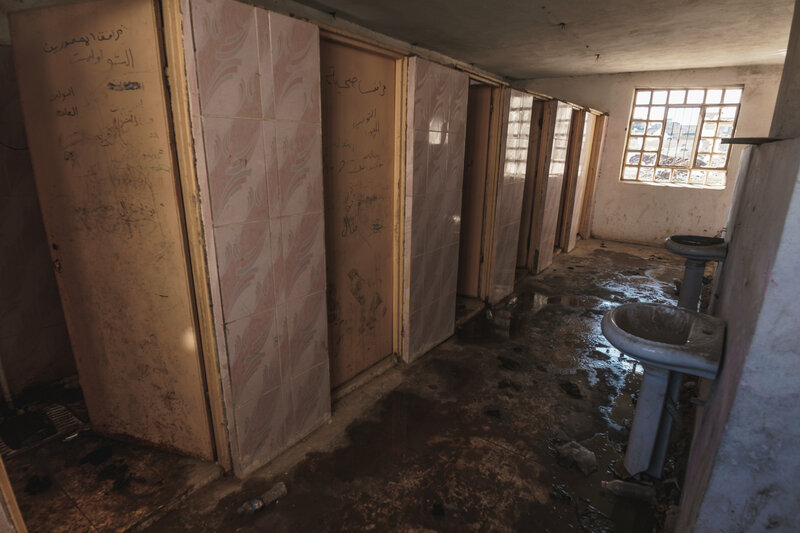 We have built shower and toilet blocks in refugee camps, informal settlements and on deserted routes used by people fleeing Syria and have installed or repaired toilets in communities hosting refugees. Piped water schemes are being developed for Jordan’s Zaatari refugee camp and in host communities in the Bekaa Valley in Lebanon. We are also providing clean water to Syrians inside their country through rehabilitation of infrastructure, water trucking and repairing of wells. Many refugees face brutality and poor treatment. Every day, approximately 50 boats with refugees or migrants, fleeing war or poverty, arrive off the coast of the small island of Lesbos, Greece. Desperately seeking safety in a new country, refugees pay traffickers amounts of around €1,000 per person (€800 if you're over 60 or if the weather is bad), to risk their lives on dangerous journeys. Some are lucky enough to get to beaches where they face volunteer groups across Europe, others are not so lucky. 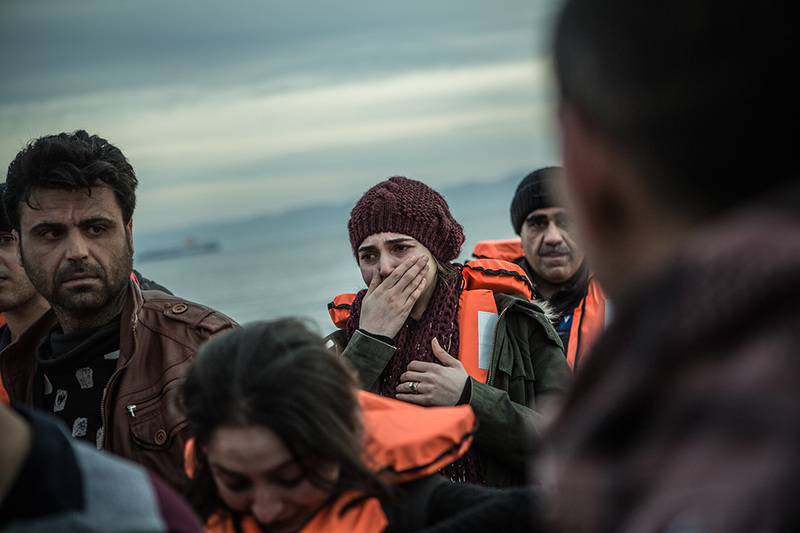 More than 4,000 people fleeing for their lives, failed to reach the coast in 2015. Our call for safe passage is founded in the belief that all people have the right to a life of dignity. The EU must urgently provide safe and legal passage for migrants and refugees coming to Europe. Refugees and migrants must not be forced to risk their lives or resort to extremely dangerous measures to continue their journey. All photos by Pablo Tosco/Oxfam.